" Best price on the web." With the Vietnam War raging in 1969, two young fathers report for duty. A man of great faith and a doubtful cynic. A quarter-century later, their sons, Wayne and John Paul (David A.R. White and Kevin Downes), meet as strangers. Guided by handwritten letters from their fathers from the battlefield, they embark on an unforgettable journey to The Wall—the Vietnam Veterans Memorial in Washington, D.C. Along the way, they discover the devastation of war cannot break the love of a father for his son. 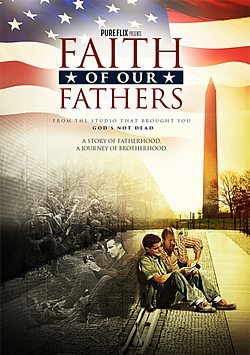 A powerful film about faith, freedom, and fatherhood from Pure Flix, the studio that created God’s Not Dead, presents FAITH OF OUR FATHERS. A story of fatherhood. A journey of brotherhood. You, Dad, are wired with everything you need to be a great father to your daughter. The First-Ever Word-For-Word Uneditied Movie Adaptation Of The Biblical Gospel Of John, Telling The Story Of Jesus. Find me is a heartwarming film that follows three families as they adopt children from China. This feature-length documentary journeys with them as they seek to discover the back story of those who loved them first. I am giving this movie a three out of five stars because when the movie finished, my wife and I both looked at each other and went, "Do you feel quite disappointed by this movie?" to which we both answered, Yes. It's alright, but nowhere near the likes of God's not Dead or Gallows Road, the likes of which dwarf this movie in experience.